In terms of mechanic's lien law, a notice of completion is filed by property owners and served on all contractors and potential lien claimants to put them on notice that the time for filing any lien is now ripe (and begins the 40-day clock for them to file). It is used to protect property owners who may be subject to a lien by "smoking out" the lien claimants and telling them if they have a lien, now is the time to file. In short, filing a notice will reduce the amount of time a lien claimant may file from 90 days to 40 days after the last work or improvement on the property. The notice of completion essentially is used to put contractors and other lien claimants on notice that the work or improvement has been completed and therefore triggers the time for filing a lien. The form is designed for property owners to use in order to ascertain all potential lien claims on the land or buildings. After work on your property is completed or otherwise stopped for 30 days, use and record this form to begin the time in which any possible lien claimant may file his or her lien. -	The cessation of all work on a work of improvement for 30 consecutive days, provided a notice of completion is timely recorded and served and the work is not resumed under the same contract. -	The date of completion of the work of improvement. -	The owner's name or owners' names, as the case may be, the address of the owner or addresses of the owners, as the case may be, and the nature of the title, if any, of the person signing the notice. -	A description of the property sufficient for identification. -	The name of the prime contractor or names of the prime contractors, if any. The notice must be verified by the owner or by some other person on the owner's behalf. The notice need not be acknowledged to be recorded. -	Each prime contractor with whom the owner contracted for all or part of the work of improvement. -	Each potential lien claimant who, before the notice was recorded pursuant to this section, either submitted a request to the owner to receive the notice or delivered a preliminary notice of right to lien pursuant to NRS 108.245. Timely filing this notice is important if the work on your property has stopped. 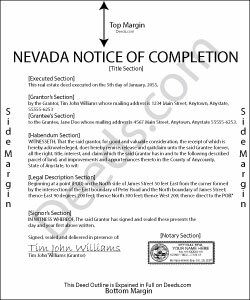 If the owner fails to file and/or deliver a copy of the notice in the time and manner prescribed under Nevada law, the notice of completion is ineffective with respect to each prime contractor and lien claimant to whom a copy was required to be delivered. Therefore, it would not start the 40-day clock ticking against any potential lien claimant, and any lien claimant would retain the default statutory period of 90 days from the last work of improvement provided to your property. This in turn could cause disputes of fact between you and the contractor since there was no filed notice stating when the last work or improvement actually occurred. Pursuant to NRS 108.245(1)(b), a notice of lien can only be filed within 40 days of the proper recordation and service of the notice of completion. Each case is unique, so contact an attorney with specific questions or for complex situations. Kevin B. said: It looks like it can be a huge time saver. I did a deed and appeared very professional. Reply from Staff: Thank you for your feedback Debra. Be sure to download the forms and fill them out on your computer, they should not be filled out "online". Have a great day. Barry N. said: The form was straight forward and very easy to complete. It took me less than 15 minutes to complete. Make sure you have the "current deed' available' when completing the form. Reply from Staff: Thank you for your feedback Barry. Have a fantastic day!